Some Boko Haram terrorists in 5 gun trucks, motorcycles and 2 Golf cars laden with Improvised Explosive Devices (IEDs) from Sambisa forest axis attempted an attack on 121 Task Force Battalion at Pulka. The incident, which occurred on Friday was repelled by vigilant troops who rose to the occasion and successfully killed 7 Boko Haram terrorists, wounded several others and recovered 4 AK-47 rifles, 3 AK-47 rifle magazine and 92 rounds of 7.62mm (NATO) belt ammunition. In a related development, troops of 3 Battalion nabbed a suspected Boko Haram terrorists’ spy near the Battalion Headquarters at Gamboru Ngala. A statement from Col. Sani Kukasheka Usman, Army Spokesman, said on interrogation, the suspect confessed that he was sent to spy on the troops from Wulge. “Consequent upon this, the troops organized a fighting patrol comprising elements of Army Headquarters Strike Group and Civilian JTF to Wulge and Walamari. The troops encountered Boko Haram terrorists in which they killed 27 of them, recovered 5 motorcycles and 8 bicycles. They also cleared 12 terrorists’ camps and recovered 1 AK-47 rifles as well as 1 Dane gun. “The troops also rescued 455 persons and escorted them to Gamboru Internally Displaced Persons’ (IDPs) camp. Unfortunately, we lost one of the Civilian JTF. Nevertheless, the troops’ morale remains very high. 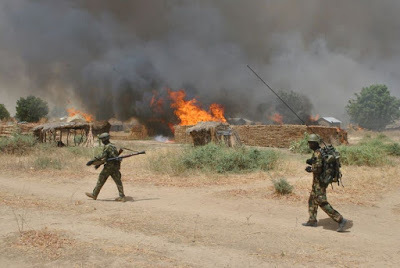 “Similarly, troops of 103 Battalion this evening ambushed Boko Haram terrorists at Mairimri village crossing point in which they killed quite a number of terrorists, recovered 15 bicycles and foodstuffs.” the statement said.